NASA released on Wednesday more of the first images of Mercury taken by a spacecraft orbiting the planet, including the first color closeups depicting it in all its pock-marked glory. The images were taken by NASA's Messenger spacecraft, the first mission to orbit the planet closest to the sun, according to Messenger's website. Mercury has been seen up close before in fly-bys, but this mission marks the first complete long view reconnaissance of the planet’s geochemistry, geophysics, geologic history, atmosphere, magnetosphere, and plasma environment. The mission also allows NASA and its partner, The Johns Hopkins University Applied Physics Laboratory, an opportunity to show off Messenger's impressive Mercury Dual Imaging System, which has two cameras: the Narrow Angle Camera and the Wide Angle Camera, NASA said. 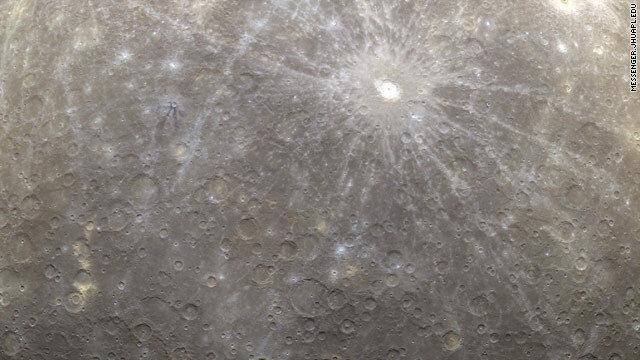 The first image acquired by Messenger, which was released Tuesday, was part of an eight-image sequence for which images were acquired through eight of the wide angle camera's 11 filters. A color version of that first imaged terrain, pocked with craters, was obtained through the filters and displayed in red, green, and blue, respectively, NASA said. Over the next two days, Messenger will acquire more than 1,000 additional images in support of a phase to review spacecraft and instrument performance. The yearlong primary science phase of the mission will begin on April 4, during which it is expected to acquire more than 75,000 images. The Messenger spacecraft launched on August 3, 2004, and after fly-bys of Earth, Venus and Mercury, started its historic orbit around Mercury on March 17. The Johns Hopkins University Applied Physics Laboratory built and operates the Messenger spacecraft and manages the Discovery-class mission for NASA. Messenger is an acronym for MErcury Surface, Space ENvironment, GEochemistry, and Ranging. I love space exploration and all, but wow. Color photos of a planet that's 95% gray. PS: Mythbusters debunked most of the "fake" moon landing myths, and I have no idea why morons had to bring this up here. So is that Bush's fault, or Obama's? Or maybe of government conspiracy to cover up the fact that a race Big Foots actually runs the country? What an amazing mission! Awesome pictures! It's heartening to think we are still advancing our knowledge and reaching for the stars, despite all the luddites, myopes, and general science haters out there. Stay curious, people! The sad part about space exploration is that the big motivation is war. Wars are the catalist for science and technology. When countries really work together we will have a real star trek world working together. Most of the research done today has a weapon component on it. Even medical research a few times is there to create a perfect soldier. We need to go to space for the right reasons and with private companies in charge. The NASA model of business is obsolete. Private companies would have done more, in less time and with less money. The flag has a small wire passing through the top of it so it looks like its waving in the wind. The moon is not that far from earth (in the big picture) there were plenty of people that tracked the capsule all the way to the moon with telescopes. I guess you are going to say the space shuttle never made it to space either. Maybe we did get some technology from UFO's to help do all this. Is that really that far fetched? The universe is very big. Jazz7> I love the fact that you are this lone creative Free Spirit buzzing and zipping about from one intellectual post to another. I just luv it! That is what the Planets name sake was known for doing as well, Mercury the speedy messenger. Shotzbot, has been banned from commenting on CNN......No reason given just one small voice for freedom and liberty denied their rights of free speach by CNN. Shotzbot, has been banned from commenting on CNN......No reason given just one small voice for freedom and liberty denied their rights of free speech by CNN. Talk about bang for your buck, you guys know that the Cassini mission to Saturn is STILL returning pics and data? As an old dude growing up in the late 40's and the rockin' 50's I fully support NASA and all that they do. What better return for a measly couple of billion bucks than an understanding of our surroundings? Those droll trolls out there that blast this agency don't know a quasar from a hole in the ground IMHO. Why can't we view our post? Where is it?